Peter Devine	– design. online. print. motion. 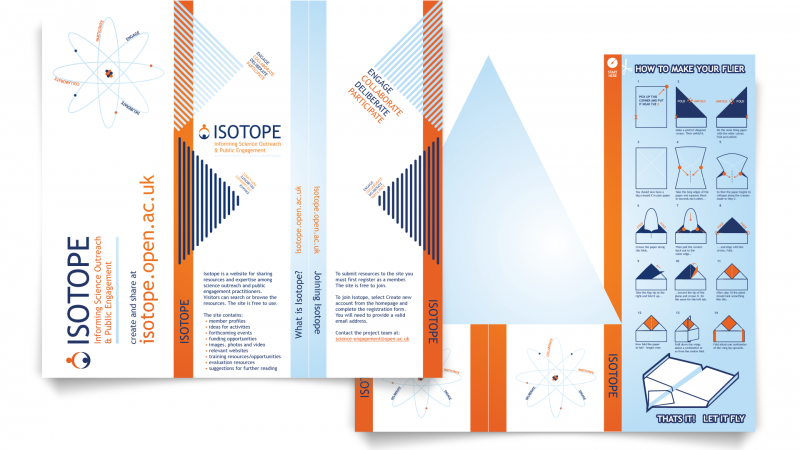 Informing Science outreach and public engagement or ISOTOPE was an attempt to provide help and resources to people engaged in science outreach. I was introduced to the ISOTOPE project through a series of steps. My initial engagement was to iron out some crinkles in the project logo and adjust the colours to ensure they were web safe. This involved re-drawing the logo in Adobe Illustrator – the original artwork having been completed in Freehand a software package which was discontinued. Following on from my initial work I was invited to develop some motifs around the words: engage, collaborate, deliberate and participate. These motifs would be used on balloons and t-shirts. The final part of the work came when I was asked to produce a flier for the project. Given the nature of the project I wondered if there was a way to provide some delight into the normally mundane paper flier. I decided to develop a paper plane as the flier. The client liked the idea and we went on to print the design on some appropriate paper so that the folds would remain crisp and the place would fly well. Posted in: Graphics, Illustration, Interactive, Portfolio.